When Danny Perlman’s father, Fred, passed away due to heart failure in the middle of Danny’s sophomore year, Danny was devastated. His father was his best friend, and losing him drove Danny further and further into isolation. He took time off from school and stopped hanging out with his friends. After weeks of secluded sadness Danny returned to Lincoln Forge High School, where he got a wonderful surprise: His fellow students had chosen his late father as their new mascot. Danny wasn’t the most popular kid. He wasn’t captain of any teams. He wasn’t prom king. But that day, when he walked through the front door, everyone was cheering for him. 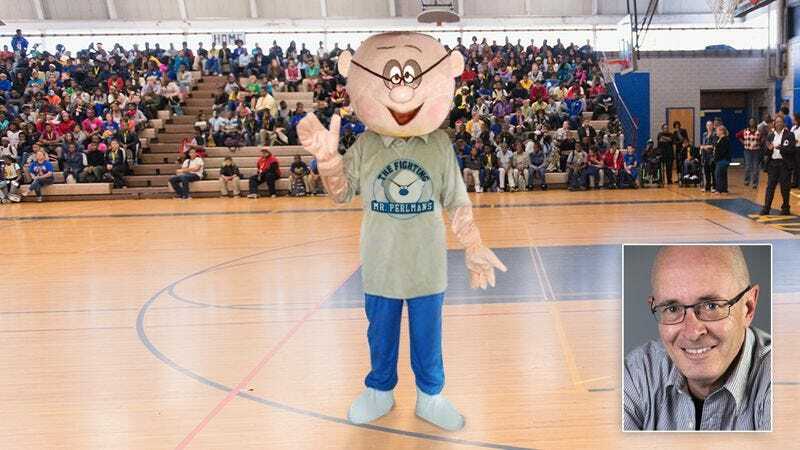 The entire school was absolutely decked out with banners of the new logo, hundreds of students were wearing jerseys and T-shirts with a cartoon drawing of his father, and the brand-new Fred Perlman mascot was dancing and firing a glitter cannon at him. And it’s not just the school that’s stepping up—the town of Lincoln Forge is also rallying around Danny. Shops and homes are hanging Fightin’ Mr. Perlman pennants and posters up and down Main Street, and people are even donating money to send Danny to away games so he can watch the hilarious antics of the mascot version of his dead father at every single event!